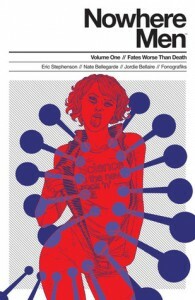 Nowhere Men, Volume 1 tells the story of a world that treats scientists like rock stars and celebrities. Not only do they get flashy photo opportunities and magazine cover stories, but their influence spreads so far throughout society that it causes huge leaps forward in scientific developments while also inspiring an anarchist “punk” subculture. In this world, cloning is commonplace and a robot went on a mission to space decades ago. In the first volume, Stephenson weaves together two story lines. First, we meet the founders of World Corps, a foursome of scientists who enjoy rock star levels of fame and success until their partnership begins unraveling in the public eye. The timeline jumps back and forth from as early as the 1960s to the “present day”, which is where we meet a group of World Corps scientists dealing with a strange virus that is changing their bodies in unexpected ways (for better and worse). Interspersed with these scenes are news articles, magazine interviews, excerpts from books and advertisements that paint a fuller picture of the men behind World Corps, all done in pitch-perfect period style (with “yellowing” pages to boot). So, on one hand this book turns scientists into the Beatles and watches how that changes the world, and on the other it deconstructs the Fantastic Four origin story and includes a much higher mortality rate. Tie this all together with an epistolary conceit, and you have an ambitious book that plays at the edges of comic book tropes without straying too far from the center. I really think it’s a fair comparison to say that Stephenson is playing with the form in much the same way that Alan Moore did with Watchmen. However, the scope of this story feels larger, if only because this first volume serves mostly as setup. Stephenson definitely has a flair for characterization, at least when it comes to the founders of World Corps. I felt like I really had a clear sense of their personalities within the first few pages, and that sense only deepened with every interview and flashback. The group of scientists affected by the virus fared a little worse, if only because there are so many of them, and they spend most of the story in reactive mode, freaking out because they’re sick and don’t know why. I have a feeling Stephenson will correct this as the story goes on, however, simply because this first volume sets them up as potential heroes in opposition to the various misdeeds of World Corps (not that I think the story will be that clear-cut). My only other criticism of this first volume is that it feels like Stephenson only provides the barest hint of an overall story arc; instead, the first volume mostly consists of back story and setup. However, there’s so much detail crammed in here that it seems clear that the first volume is only the first few chapters of a larger story, and not a discrete story arc in and of itself. Overall, I really enjoyed this book, and I’ll definitely be picking up future volumes. The only downside is that it looks like Image is releasing new issues at a glacial pace, and #7 is nowhere on their calendar. Even still, highly recommended.